Yay, the newly upholstered furniture has arrived ! It's a feast of riches; a revived and improved sofa, an updated wingback chair, a decorative pair of armchairs and a vintage wooden chair with modern lines. I'm so excited that things worked out so well. 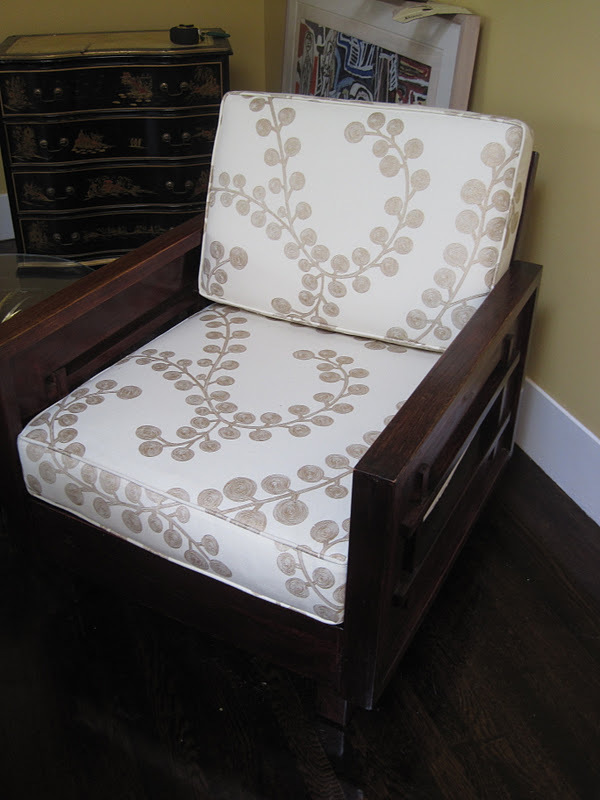 I picked the upholsterer from a single review on the Berkeley Parents List, which wasn't much to go on. After meeting Carlos I was reassured by his ideas and his manner and I highly recommend him. His work speaks for itself, it's beautiful. He was prompt, polite, full of good suggestions and his quote was affordable. You can see the fab wingback chair 'after' and the bedraggled 'before' shots below. As you can see above, the linen had worn through on the armrest and it sorely needed refreshing. 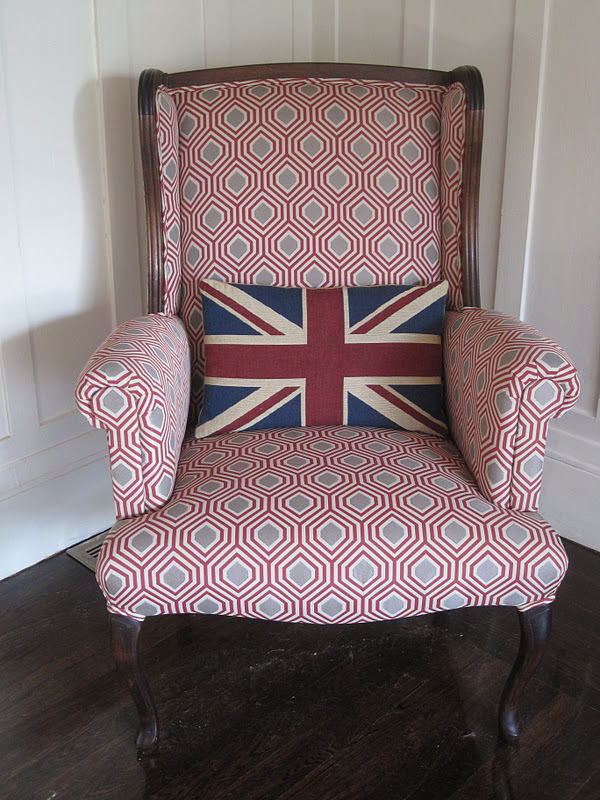 To revive it I went with a graphic red and grey Kravet fabric which gives it a more contemporary feel and the flag pillow finishes it off with a pop. 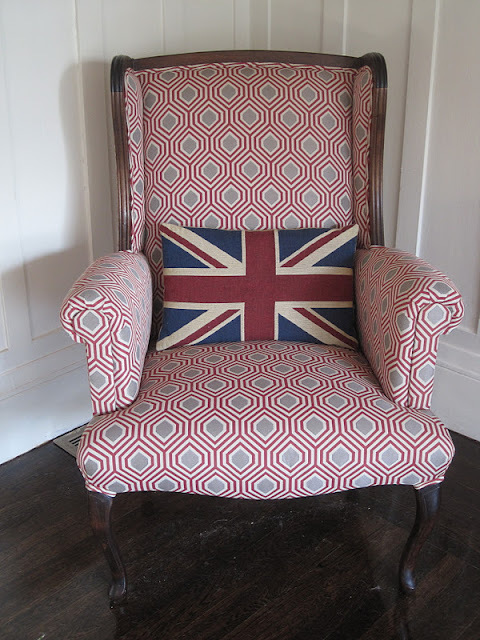 I'm thrilled with the transformation, as you can see the new fabric really revived it! The sofa cushions were dreadfully compressed and looked rather tired. The down pushed right through the material and created a mess. Carlos replaced the seat cushions with new foam and on the back cushions he made new packets for the down which should keep it in check. The 'new' sofa looks great, and it was affordable to recover as I had a bolt of fabric left over from a project my mother did four years ago. 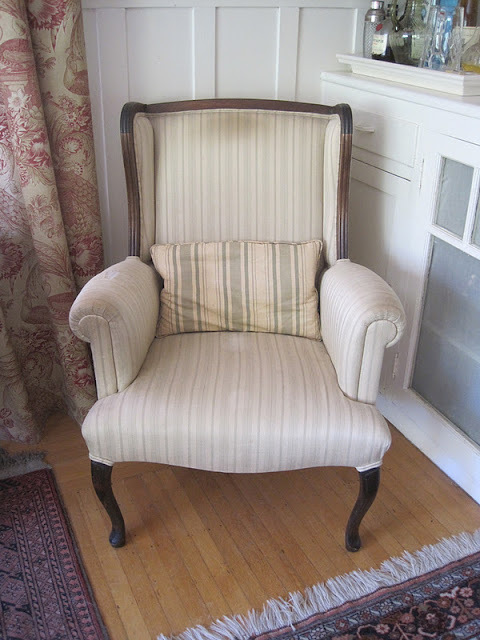 We also had a pair of green velvet chairs were looking rather shabby, one had split along the seam on the arm and both were stained. I was thinking about replacing them when I found a wonderful suzani fabric at www.housefabric.com. 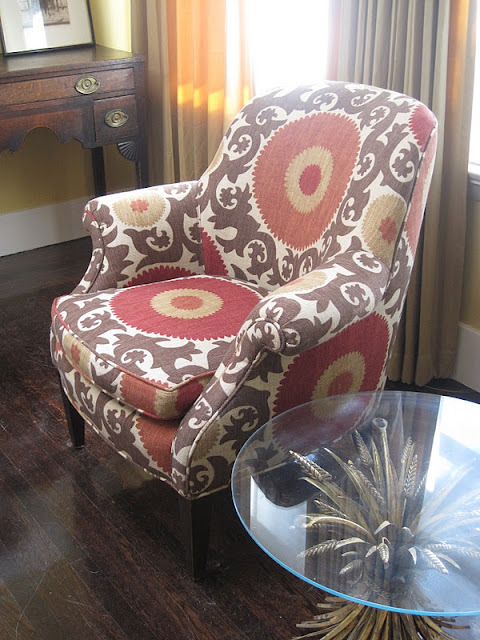 It was a bold choice, and I was nervous it would be too much, but the finished chairs are beautiful and stylish. Carlos did an amazing job laying out the fabric which really is an art. The final chair Carlos recovered is a particular favorite of mine. I bought it an junk shop for $36 and refinished it myself years ago. I bought what I could afford, cream Sunbrella cushion at a Smith and Hawken outlet, but I always knew it could look better. The seat was hopeless and you always felt you were going to end up on the floor. Carlos rebuilt the seat and reupholstered the cushion reshaping but reusing the foam. The fabric is a modern cream and gold organic cotton from Laura and Kiran in Berkeley. They design and manufacture their line in India and have some beautiful natural fabrics on offer. I think the chair looks great, let me know what you think...?